I found all this inspiring when I first visited Bali over a quarter of a century ago, after seeing the frenetic bustle of Jakarta first, and then the old world charms of Jogjakarta with its formal religious edifices representing a plethora of faiths. Bali struck me as very special in a different way, in particular for that wonderful air of laid back tolerance that I think characterizes South Asian cultures at their best. Or perhaps I should not say South Asian, but rather Southern, since I have sensed a similar atmosphere in the south of Europe and in South America. But in saying this I am perhaps laying myself open to a charge of prejudice against Northerners, who like to see themselves as more hardworking and focused. And conversely there are those in the North who might see what I say as complimenting them, encouraging their feeling that lazy southerners should not be permitted near the Euro, or even the European Union. Protestant values, they will say, as enunciated by Durkheim in one of the initial examples of the relentless categorizing the 19th century gave birth to, are traduced by conjunction with those who experience what Norman Douglas immortalized as the South Wind. Is there something in all this, this classification of peoples into different categories in terms of values? Certainly we hear such characterizations often, as with the claim some years back that there were distinctive Asian values that promoted responsibility rather than the frivolous and destructive liberalism of the West. Ironically that assertion came from those who subscribed wholly to the political dominance of the West. Looking then at the various classifications human beings indulge in, one feels that they tend to pick and choose what is convenient, and presents themselves in a positive light. But I think understanding this provides a key to what we should be thinking of when we talk of pluralism. Unfortunately there has been a tendency to see pluralism as a doctrine that emphasizes differences. It is seen as recognizing different characteristics in different people and treating these as seminal. On such a world view, we can recognize that differences exist, but these are less important than what makes us kin, namely our common humanity. We respect differences not because they mark us out as different from each other, but because they are part of what makes us human. There is no mould into which each of us fits, in terms of being part of a particular group. However we define the various groups to which we belong, we must recognize that there are overlaps, that characteristics can be shared, that we have much in common with those of what we consider other groups, as well as differences. We are unique as individuals, and do not need confirmation of the validity of our identity through association with a group or dissociation from other groups. I see this as a profoundly liberal perspective, because it privileges individuality above all. We respect others then, not because they are different, but because they are just like ourselves, a mass of different characteristics which contribute to an individuality that is like no other but is also not intrinsically different from any other. 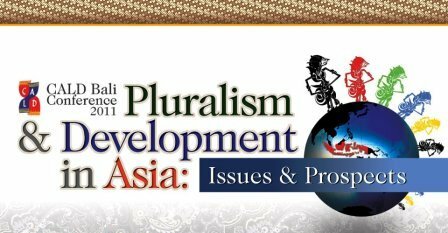 I will not dwell too long on this since I will be talking at length later on ‘Incentives and Constraints to Building and Strengthening Pluralistic Societies’ and hope to present this perspective as facilitating the strengthening of a pluralistic society. Let me conclude then by thanking our hosts, the Indonesian Democratic Party of Struggle, for allowing us to enjoy this inspirational venue, as well as the CALD Secretariat for as always arranging a fascinating event. We are grateful too to the Friedrich Naumann Stiftung and its regional director Dr Rainer Adam for supporting us, the more readily I suspect because of Dr Adam’s long sojourn in this country, which suited his cosmopolitan approach to life admirably. I am thankful also to Liberal International for joining us here, and to our President Hans van Baalen, whose ready involvement in the aspirations of other countries is an encouragement to all of us. Finally, let me thank our chief guest today, albeit in absentia, Her Excellency Megawati Soekarnoputri, former President of Indonesia, for gracing the occasion. I am afraid I am old enough to remember the enormous dynamism of her father, who was an inspiration to all colonies striving not only for independence but to an inclusive and prosperous future for all their people. The manner in which he sought to create an Indonesian identity, that avoided privileging any religion or language or ethnic group was extraordinarily innovative at a time when, in struggling against colonialism, many leaders adopted a narrow nationalism. Panchaseela, Bahasa Indonesia, and above all the privileging of human values above narrow concepts of identity, now hold Indonesia in good stead as she advances towards the full fruits of democratic pluralism.